One of the prime motivations for me to attend the Québec Festival d’été for the first time in 2001 was the knowledge that accordionist extraordinaire Ionica Minune would be doing a number of appearances at the festival. I’d known of his playing from the recordings of Romane (gypsy swing guitar) and from the French group Les Yeux Noir. I didn’t quite know what to expect other than fabulous accordion playing. As I approached the Place Metro venue from a couple blocks away for my inaugural Festival concert experience, I could hear an unusual rhythmic and melodic thunka – thunka – thunka coming from the stage where Ionica was slated to appear. Turned out to be my first exposure to the ‘large cymbalom’, and was played by Romanian virtuoso Giani Lincan. 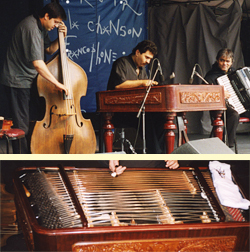 The effect of this instrument – a piano and a drum rolled into one – is unique, especially the bass notes, when hearing them played rapidly chromatically. If you are seated on the same level as the large cymbalom, affording you a good view, it is a particularly exciting instrument to watch being played – the player’s hands and mallets ‘ablaze’, as it were. Along with fiddler/bassist Costel Birlic, these brilliant Romanians thrilled me during 6 different shows over 2-1/2 days of the Festival. These guys played jazz, classical, Hora, Django, Khatchaturian’s ‘Sabre Dance’, everything. And fast – really, really fast. Tunes that stand out in memory are Giani’s unaccompanied version of ‘Nuages’, and the group’s rendition of ‘Theme and Variations by Paganini’. And of course, the constant improvisational interplay between the cymbalom and the accordion. The three are actually part of the Lincan Gypsy Ensemble, which features 6 or 7 players, but was pared down for this particular trip to Canada. Giani is a particularly accessible and friendly guy, speaks at least 4 languages, and lives near The Hague, while Ionica and Costel reside in Paris. Giani’s only available recording as of 2002 is The Soul of the Romanian Hora. Apparently, his ensemble has nearly completed its new CD over in Europe, hopefully available in 2003. And besides the recordings mentioned at the top, Ionica has 3 older cassettes – Volumes I, II, and III – as a leader. They are pure Romanian Hora, with an ensemble. One volume features his splendid unaccompanied solo entitled ‘Improvatzi’ which is amazing. The recording quality of all three volumes is poor, but if you can get your hands on them, you can quickly get past the quality and into the brilliance of the performance. According to Giani, as of early 2002, it is possible that the Lincan Ensemble will return to the Festival d’été in July 2003. I hope so.